This book is about a question that bothers no one in India: Why preserve wild animals despite the danger they pose to human life and property? While the whole world is conserving wildlife as a natural resource to support national economies, India preserves dangerous animals just for the heck of it. While the world feeds millions and makes billions from wildlife, an impoverished India says we want none of it. As a result, both, the animals and people, are just struggling to survive. HS Pabla, of the Indian Forest Service, spent 35 years trying to preserve India’s wildlife, wondering: why? When he found an answer, that wildlife can be the backbone of the rural economy, rather than just being a menace, he found himself pitted against his own Government and peers. Here he bares his heart about how the Indian conservation paradigm is, surprisingly, neither rooted in its cultural and religious traditions, nor has any vision for the future. India will be poorer if she is able to save wild animals which have no use either for the tourist or for the hunter, he argues. Millions of acres of wilderness have been saved worldwide because the public wants to see or hunt wild animals on those lands. Wildlife tourism works both for people and for animals. This book, the first in a trilogy, shows how and where. This entry was posted in Animals, India, Travel, Uncategorized and tagged "Road to Nowhere", animals, blogging, Book, conservation, HS Pabla, hunting, India, tourism, Wildlife Conservation in India. Bookmark the permalink. Hi Annetbell. Saw your interest in India on the internet (below my book) and thought of thanking you. 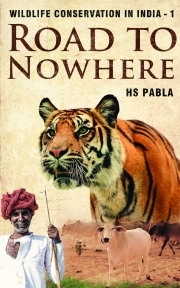 I am a retired forest officer and wrote this short book called Wildlife Conservation in India – 1: Road To Nowhere. This gives a critical look into wild India. It is available online with most retailers, both in print and ebook formats. You might like to check out. Enjoy India. How very exciting to hear from the author! I love India and though most of the time we were there was spent in cities, I would love to explore Wild India. Thank you so much for your comment!